This project is temporarily on hold as from March 3rd, 2018, due to medical issues of my wife. This project is just in the early stages, and this web page is still being build. The time and cost is for the actual building of the Bluenose model. The cost of drawings and books, and the reading/studying of those is not included here. This web page is NOT a complete instruction manual for building a Bluenose model. There are other sources that do a much better job (see References). I just pulled together information from different source for my use to build the ship with keel, frames, stanchions and some internal compartments like it was done with the real Bluenose/Bluenose II. In Oct-2017 I started reading and doing research, and in Dec-2017 I made more concrete plans. Made the baseboard and slip on 10-Jan-2018, and then came to the conclusion that I needed to order dimensioned basswood. I was not happy the way my version of the frame sections turned out. Then on 1-Feb-2018 I happen to find the modeling instructions by Gene Bodnar based on the blueprints from P.F. Eisnor. It is exactly what I had in mind of modeling, and NOW I was ready to begin the actual modeling as of 1-Feb-2018. Before starting with the project it is important to give a summary of the history of the Bluenose and Bluenose II. It will also illustrate the decisions on scope and scale of the project. Bluenose was a fishing and racing schooner. She was designed by William J. Roué of Halifax, and built at the shipyard of Richard W. Smith & George A. Rhuland in Lunenburg, Nova Scotia, Canada. The building was overseen by shipwright John Rhuland. The Bluenose was launched on March 26th, 1921. Fishing was done over the banks in the Atlantic Ocean off the coast of Nova Scotia. 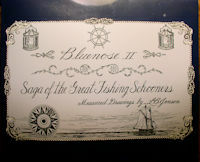 The Bluenose was a fine fishing schooner, holding the record for largest single catch ever landed in Lunenburg. However, what made her famous was as a racer for the International Fishermen's Trophy. Under her skipper, Captain Angus J. Walters, she won undying fame for Nova Scotia and Canada. During World War II she entered the West Indies trade, where her life ended when she broke her back on a coral reef off the coast of Haiti in January 1946. Nova Scotians are called Bluenosers, and that is where the schooner got its name. Philip F. Eisnor's model ship blueprints (7 sheets) of the Bluenose Schooner may be perhaps the most accurate representation of the Bluenose as she was in 1921 when she was launched and ready for the fishing grounds. Eisnor spent many years in researching this project. Much of his time was spent in the Nova Scotia archives and talking with people in the Lunenburg area who sailed on the Bluenose along with some of the shipbuilders who were responsible for building her. sheet 6, SC-020-5, Mar 2007 Hull Framing 1/4"=1' Copy of Jenson page 38? sheet 7, SC-020-6, Mar 2007 Hull Frames 1/4"=1' Copy of Jenson pages 38, 40 & 41? PLUS -- The scale 1/4"=1' (1:48) drawings result in a nice size model of 44"/112cm long (hull plus projections), 6-3/4"/17cm wide and 35-1/2"/90cm high (keel to top of main mast). 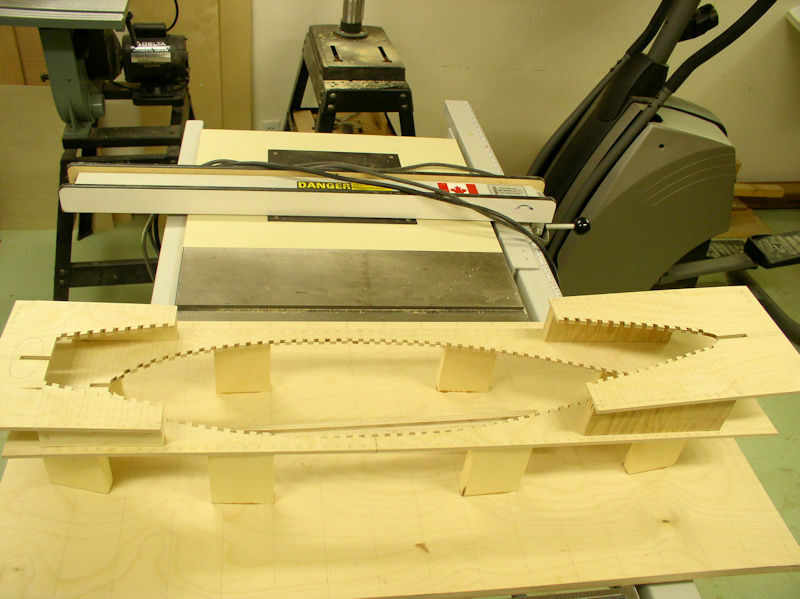 Drawing measurements taken from the drawing in inch or cm can be used straightaway to measure the model wood. Except the Rigging & Sail Plan (sheet 5) where measurements have to be multiplied by 2. MINUS -- The drawings have no written measurements on it. It would be nice to be able to compare a taken measurement against the written measurement. Drawings do have errors sometimes! Bluenose II was launched at Lunenburg on July 24th 1963, built to original plans and by some of the same workers at Smith and Rhuland. Shipwright John Rhuland oversaw the building of the Bluenose II. The original captain of Bluenose, Angus J. Walters, was consulted on the replica's design. The replica was built for Oland Brewery for roughly Can$300,000 (1963 Canadian dollars) as a marketing tool for their Schooner Lager beer brand. The Bluenose II was the last living example of the great two-masted schooners, and a perfect sailing replica of the original Bluenose. On September 7th, 1971, the Bluenose II was sold to the goverment of Nova Scotia for the sum of Can$1.00. After several years the province gave possession of the ship to the "Bluenose II Preservation Trust". The trust's mandate was to restore the aging schooner to full operational status and continue to operate her for the people of Nova Scotia. In 1994-95 the ship had its first restoration, but only a small amount of the Can$2.3 million allocated for the schooner have been used for restoration works. It was a well known scandal. The trust maintained and operated Bluenose II until March 31st, 2005, when the government of Nova Scotia placed the vessel under the management of the Lunenburg Marine Museum Society at the Fisheries Museum of the Atlantic. In July 2010, the Nova Scotia government awarded a Can$12.5 million contract for the restoration of Bluenose II to a consortium of three Nova Scotia shipyards. When the ship was finally relaunched on September 6th, 2013, after major delays, the final retro fit cost was closer to Can$ 16 million for the Nova Scotian Government alone. This restoration was not without controversy because sources stated the restoration was not intended to create an authentic replica of the original Bluenose and that the builders would not be using the plans. The original schooner was largely scrapped and the schooner was built from keel up with new materials. Some equipment and sections of the old schooner were retained, but the schooner is essentially a new vessel. This has led Joan Roué, a descendant of the original Bluenose's designer William J. Roué and current rights-holder of the design, to question whether this should even be considered the same ship. In the summer of 2016, Bluenose II renovations were finally completed, and it serves now as a tourist vessel. During the years that the Oland family sailed and operated the Bluenose II, after building her in 1963 for the people of Nova Scotia and Canada, they got often questions about her dimensions, hull, sail plan and rigging. In 1970 Don J. Oland approached the noted marine artist and historic illustrator, Commander L.B. Jenson, RCN (Ret'd) and asked him if he would undertake the task of producing the meausred drawings while the Bluenose II was still a fully rigged and working schooner. 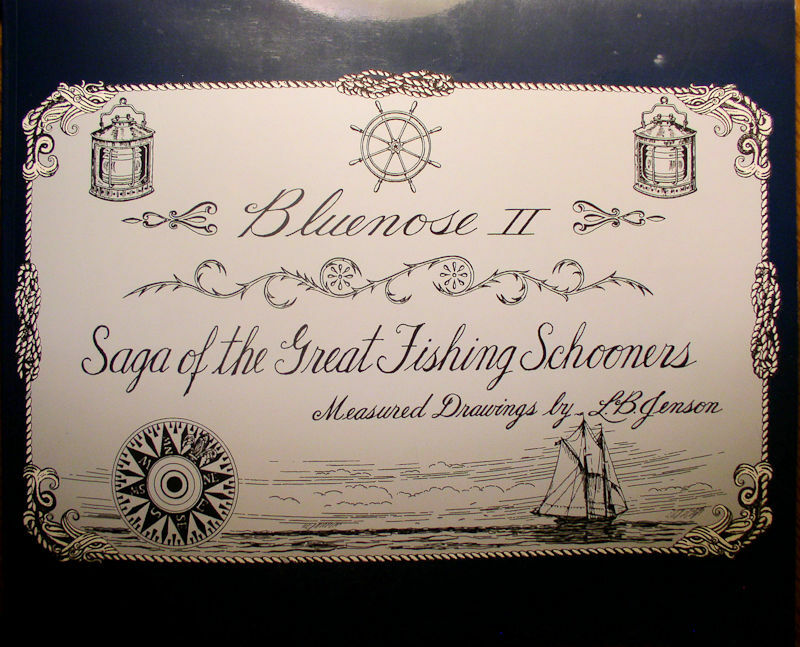 After 3½ years Jenson's work was completed and resulted in the limited edition (1,000 copies) of "Bluenose II, The Last of the Tall Schooners, measured drawings", by L. B. Jenson, 1975, Open Library OL18833343M, 32 pages. Mr. Jenson's interest was developed and he wanted to do much more; how the Bluenose II wooden schooner was constructed, the terminology used, the evolution of the development of the schooner under sail until the diesel engines took over, and he wanted to record how the fishing trade was carried out during the days of sail. For the bigger project Mr Jenson and Mr. Oland formed a partnership which resulted in the book "Bluenose II, Saga of the Great Fishing Schooners, measured drawings", by L. B. Jenson, 1994, ISBN 1-55109-063-5. 140 pages. PLUS -- Great place to read up on the history of Bluenose, Bluenose II, and fishery schooners in general. Superb detailed drawings that are very useful to complete the model with realism and finesse. MINUS -- The measured drawings in Appendix I are nice, but have several disadvantages too. The measurements are in real life feet and need to be converted into scale model measurements. NOTE: feet divided by 4 gives the model measurement in inches (scale 1:48). Several measurements are blurred and simply not readable, even under a well lit magnifying glass. The drawings have an ackward scale of 1"=6.9...'. And each page has a slightly different scale too; even the horizontal and verticals scales are not the same. Most likely caused by the printing process. Due to the size of the pages each measured drawing (Appendix I) is split over two pages with an overlap on each page. For example, there is no way to measure the total length of the hull in one go; not that I wanted to do that with the dynamic ackward scale. DO NOT TRUST ANY DRAWINGS -- To illustrate that you should not trust any drawings, especially in books, just read this. I wanted to copy the buttocks profiles on page 114 in the model scale size. The vertical "buttocks out" lines are 12' on port side and 12' starboard side which is 24' total, and measures 3.45" in the book. So that needed to be enlarge to 6.0". 6.0 / 3.45 = 1.74, so I had to enlarge that drawing part to 174%. The main breadth is 27' or 6.75" in model scale. I measured the main breath at the 18' water level and that was 4". 6.75 / 4.0 = 1.69" so I had to enlarge that drawing part to 169%. WHAT IS WRONG IN THE DRAWING, the vertical buttock out lines or the buttock profiles??? We will never know. Finally I measured the vertical 24' waterline and it was 3.5". So that needed to be enlarge to 6.0". 6.0 / 3.5 = 1.714, so I had to enlarge that drawing part to 171%; a significant difference with horizontal enlargement requirements of 174% and 169%. Hence different horizontal and vertical scales, and a possible drawing error. Therefore taking direct measurements or copies from these drawings is useless!!! Just some real life measurements from L.B. Jenson's book (page 17 and specs) and P.F. 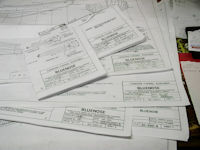 Eisnor's blueprints model measurements. Other measurements are calculated to allow apples-to-apples comparisons. Add percentage difference. As we are building the Bluenose we those measurements as given. SAYING -- IGNORANCE IS BLISS. The real difficulty starts where multiple sources on the same subject/project give different information. The measurements of the Bluenose and Bluenose II are supposed to be the same, or very close, but they are not. There are differences of up to 2 feet or 1/2" in scale measurements. The Eisnor blueprint state that the overall hull length is 143' which should be 35-3/4" in scale measurement. I measured the hull lengths on all drawings and the maximum length I measured is 35-3/8", i.e. 1'6" shorter in real life size. I doubt that the blueprints has shrunk that much. I bought L.B. Jenson's book in 2010, and put it away after a quick scan for a future project. I picked it up again this year (2017) and read it from cover to cover, and I was hooked. The only difference of the Bluenose II from the original Bluenose are in (tourist) accommodations & stowage and the addition of modern navigation devices and safety equipment required for sea-going certification including carrying tourists. MY STARTING POINT -- Initially I wanted to build the Bluenose II in a scale of 1cm = 1foot (scale 1:30), because I wanted to model the whole interior too and needed the space to do that; basically true replica inside and outside of the Bluenose/ Bluenose II. The deck would be removeable otherwise what is the point, right. I want to build the model from scratch. SCALE -- The scale of 1cm=1' (1:30) would result in a model of about 70" (197cm) long and 57" (144cm) height. We have a big house, but I would need a boathouse to display it. 1/4"=1' (1:48) is typically the largest size used in ship modeling, so that is what I will use. MODELING THE INTERIOR -- Since I wanted to model the full rigging, including the sails, making the deck removable would be a challenge. The deck would be in sections and joints are bound to take away from the beauty of the ship. I will satisfy myself by making some top structures removable and allowing a peek inside instead. KIT OR SCRATCH BUILD -- I built models of the Cutty Sark in 1990 and the Blue Shadow in 2003, both from a kit using planks on frames. I feel that I have the skills to build from scratch. And of course it will be planks on frame construction. If need be, I found online stores where I can buy modeling material. POSITION OF MASTS -- The Eisnor blueprints has a discrepancy in the position of the mast. Sheets 2 and 3 show the centres of the mainmast and foremast at about 16-1/2" and 25-1/2" from the stern, while Jenson's book and Eisnor sheet 6 show them at about 16" and 25". Tough decision, but considering that the Bluenose specs (Jenson, page 18) specifies "Deck to overlap for four feet ahead of mast" make the mast position of sheet 2 and 3 more appropriate. RABBIT IN KEEL -- That is where the hull planking meets the keel. Eisnor sheet 6 and Jenson pages 23, 38 and 39 show the rabbit in the second keel. Eisnor sheet 7 and Jenson pages 40 an 42 show the rabbit in the first keel. Will make the decision at a later point in time. BLUENOSE OR BLUENOSE II -- I have no choice but to use Eisnor's Bluenose blueprints. So I am modeling the Bluenose, but I will augment those with the details from Jenson's book. MODELING PLAN -- I will use the Eisnor blueprints and the Bodnar modeling instructions. That combination is exactly what I intend to achieve. In addition I will use Jenson's book to view modeling details, and the modeling tips and tricks from Hubert Sicard's website Wooden Ship Modeling for Dummies (see References). Click on a thumbnail to get a larger picture and then used the back button of the browser to return. 7 sheets, Can$85.00 plus S&H. 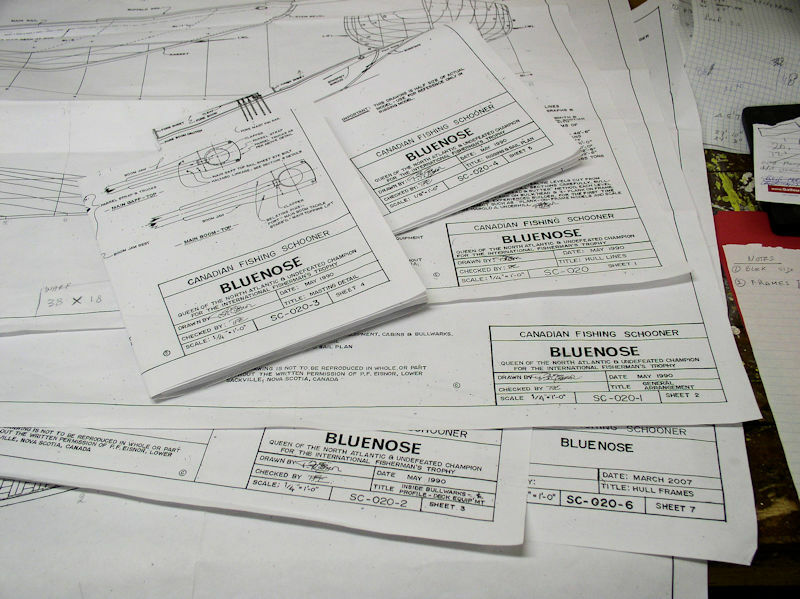 Eisnor Blueprints -- As from the discussion in the introduction we decided to build the 1:48 scale model of the Bluenose using the blueprints of P.F. Eisnor, and augment that with details from the book of L.B. Jenson. Gene Bodnar Bluenose Practicum -- The Bluenose Practicum was developed by modeler Gene Bodnar and outlines the process in detail of building a (museum quality) model of this famous schooner based on Philip Eisnors plans. Material size conversion for the main timbers. ??? This table needed ??? 3 Keel 1st, 2nd, 3rd 12"x12" 1/4"x1/4" 24"
1 Keel Shoe 3"x12" 1/16"x1/4" 24"
2 Keelson Main 12"x12" 1/4"x1/4" 24"
4 Keelson Sister 8"x8" 5/32"x5/32" 24"
4 Keelson Rider 6"x6" 1/8"x1/8" 24"
2 Keelson Rider Cover 3"x12" 1/16"x1/4" 24"
57 Frames & Cant Frames 8"x8" 5/32"x5/32"
57 Stanchions 8"x8" 5/32"x5/32" 3"
2 Stem 10"x10" 7/32"x7/32" 24"
2 Stern Post 10"x10" 7/32"x7/32" 6"
1 Deadwoods 10"x10" 7/32"x7/32" 24"
2 Horn Timber 10"x10" 7/32"x7/32" 12"
2 Spiders 10"x10" 7/32"x7/32" 9"
8 Stringers 5"x8" 3/32"x5/32" 36"
4 Clamps, first 2 5"x10" 3/32"x7/32" 36"
2 Clamps, third 4"x8" 3/32"x5/32" 36"
6 Shelf 8"x8" 5/32"x5/32" 36"
38 Beams 9"x10" 3/16"x7/32" 6"
38 Floor Timbers 8"x8" 5/32"x5/32" 6"
4 Carlings 8"x8" 5/32"x5/32" 36"
24 Ceiling 3"x4" 1/16"x3/32" 36"
3 Knees 5"x5" 3/32"x3/32" 24"
2 Hanging knees 8"x8" 5/32"x5/32" 24"
2 Break Beam 10"x10" 7/32"x7/32" 8"
70 Deck Planks 3"x4-3/4" 1/16"x1/8" 24"
2 Waterways, margins 3"x18" 1/16"x3/8" 4"x24"
24 Hull Garboards 3-1/2"x6" 1/16"x3/16" 24"
130 Hull Planking 3-1/2"x6" 1/16"x1/8" 24"
4 Bullwarks, scruppers 3"x3" 1/16"X1/16" 24"
4 Bullwarks 3"x3-3/4" 1/16"X1/8" 24"
6 Bullwarks 3"x6" 1/16"X3/16" 24"
2 Rails 3"x10" 1/16"X7/32" 4"x24"
?? Knight Heads 8"x8" 5/32"x5/32" count! ?? Spring Line Bitts 8"X8" 5/32"x5/32"
Material size conversion for the blocks, deadeyes, belaying pins and ropes. Approximate list of raw material bought for this project. Where possible I use leftover material from previous projects too; those are not listed here such as for base board and framing jigs. NOTE: Dimensions like [12"] signifies the O-Scale (1:48) of the real life size of 12"; that is 1/4" model size. We will follow the Bodnar Bluenose Practicum (construction guide). Deviations we made will be highlighted in this text. It is critical that you are working as accurate as you possibly can -- up to the point of paranoia -- as base board, framing jigs, keel and frames are the basis of a perfect model. Our headings follow the headings of Bodnar's Bluenose Practicum. 1-Feb-2018 -- For all intents and purposes the actual start of the modeling. 3-Mar-2018 -- Project is temporarily on hold due to medical issues of my wife. 25-Mar-2019 -- Project is resumed after my wife passed away on 27-Nov-2018. The project was considered completed on ???. Random notes as I find information. Rule of thumb: block size is 12 times the line diameter. 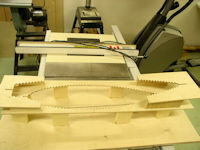 There are 4 frames per 9 feet, hence 4 frames per 2-1/4" on the model. (18) chainplate shroud, deadeye 3/16", line 0.032"
(4) chainplate back stay, deadeye 9/64", line 0.021"
8 ?? shrouds (0.75 mm) and 2 backstays (0.50 mm) for the foremast. 10 shrouds (0.75 mm) and 2 backstays (0.50 mm) for the mainmast. 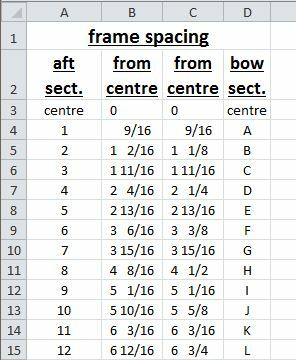 Draw the 57 frames onto Eisnor sheet 1. picture 5 gives you access to a PDF table with frame spacing. We used a 12" metal ruler. Place that one on the drawing and don't move it until you have marked all frames along the ruler. In that way your marking errors are minimized. I coloured the centre frame green, every 5th frame orange and the rest of the frames yellow as Bodnar recommended. It helps you to avoid mistakes! The Framing Grid Sheet at the end of Bodnar's Practicum is no good, so we made our own. Go to picture 4, click on it and you get the PDF file of the grid that you need to print true size. Check the measurements to ensure that all sizes are correct. Use this template to loft the square frames. We did one square frame by hand to learn how to do it, and then did all the others with our DesignCAD 3D MAX program. Bodnar, page 18 -- "Now mark the bottom edge of the keel on your grid, which is found by placing the dividers on the Hull Profile Plan at the baseline at the Midship Frame and extending the dividers open to the bottom of the keel." "bottom of the keel" is not correct. It should be top of keel or bottom of frame because the square frames rest on the keel! Slip -- From absolute flat furniture quality 3/4" plywood (multiplex) cut a board of 18"x38"; i.e. the base board. Lengthwise draw the centre line on it. Draw a crosswise line at 17" from the stern end which we will call the "centre line". Draw more crosswise section lines at 2-1/4" intervals starting at the centre line. Our base board is bigger than Bodnar's 8"x36". We did that because it allows us better use of squares so that we can position the Framing Jigs later. Next take a piece of scrapwood 18-1/2" long, 1" wide, and taper it at 3° where the stern end is 1/4" thick; the actual slip piece. 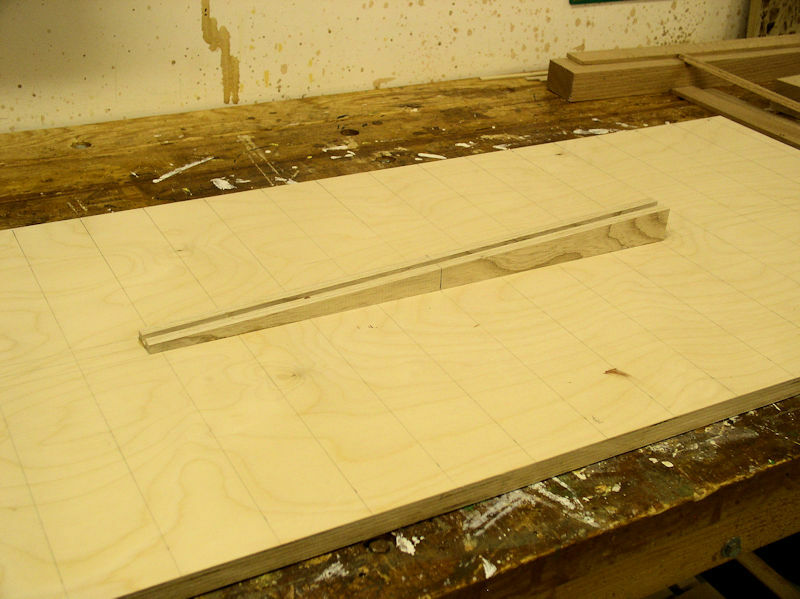 Cut a 1/4" wide slot in the centre of the top, and 3/16" deep. Mark the centre at 9-1/4". Finally glue and nail the slip piece on the centre lines of the base board (picture 6). 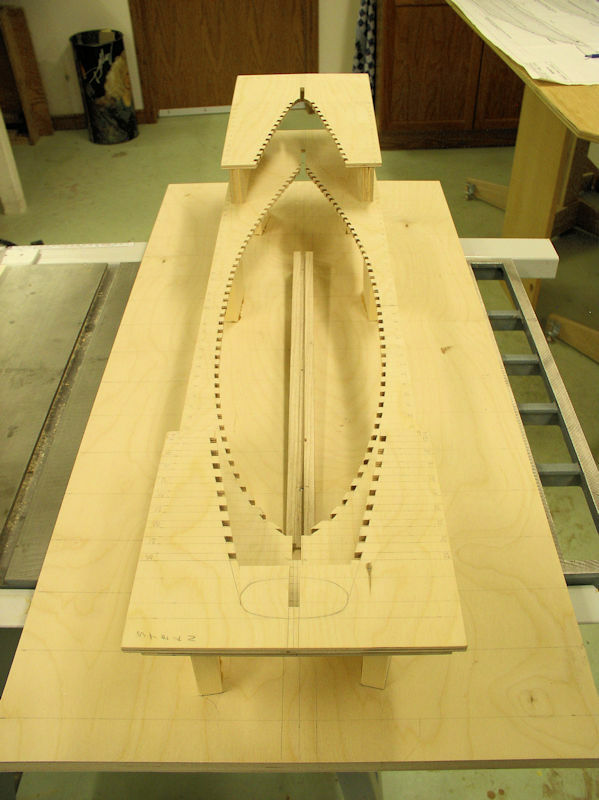 Whole idea is to build the keel in the slip slot to get the correct angle and to be able to place the cross sections (frames) at the right location and height above the baseboard. The Main Framing Jig is 8"x36". The Stern Secondary Framing jig is 8"x7-5/8" as from the aft side of frame 16 and the Bow Secondary Framing Jig is 8"x11-9/16" as from the fore side of frame Q. We used 1/4" furniture quality birch plywood. For the rest follow Bodnar's instructions. Make sure that the a top of the Main Framing Jig is at Load Water Level (LWL), i.e. 9.75 cm above the base board! See pictures 7 and 8. The size of the Secondary Framing Jigs are different from Bodnar's. The stern one is definitely wrong! On the very first day I was cutting 1/4"x1/4" keels and my pushstick got caught in the saw blade. Resulting in kick back an a piece of oak embedded in the hollow door behind me. My left hand thumb and pointing finger got some damage too. BTW, the hollow door has now three "arrow" marks !!! Bluenose II, Nova Scotia's Sailing Ambassador, Store, Books -- Go to Store and Books for the book "Bluenose II, Saga of the Great Fishing Schooners, measured drawings", by L. B. Jenson, 1994, ISBN 1-55109-063-5. 140 pages, Can$19.99 plus S&H (picture 1). Model Ship Builder, Eisner Blueprints (1:48) -- Blueprints, scale 1/4"=1', by P.F. Eisnor, 7 sheets, Can$85.00 plus S&H. (picture 2). Alternatively got to Bluenose, Nova Scotia's Sailing Ambassador, Store, Misc snd then go to Store and Misc for the same blueprints for Can$ 103.00 plus S&H. 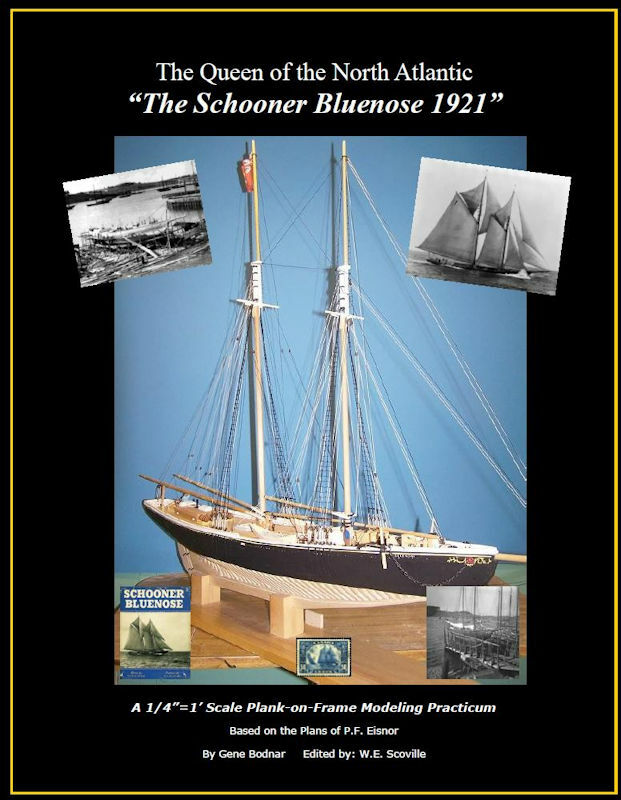 Model Ship Builder, Bodnar Bluenose Practicum -- Free download of the Bluenose Practicum by Gene Bodnar, PDF, 14 MB, 138 pages. The Bluenose Practicum was developed by modeler Gene Bodnar and outlines the process in detail of building a (museum quality) model of this famous schooner based on Philip Eisnors plans (picture 3). Model Ship Builder, Nautical Terms -- Nautical Terms for the Model Ship Builder. Wooden Ship Modeling for Dummies -- Lots of practical information, tips, forums, glossary of terms, useful links, pictures, videos, etc. A one time membership fee entitles you to free Bluenose ship plans and complete construction details, AND lots of modeling tips and tricks with pictures and videos. Fast Track, Mt. Albert Scale Lumber -- Supplies, among others, O-Scale lumber (Canadian). Hobbylinc.com -- Supplies for wooden ships such as accessories (blocks, deadeyes, belaying pins) and building supplies (wood, tools). kapplerusa.com -- O-scale (1:48) basswood, both package and bulk in 12" and 24" lengths. Advantage is their perfect order list in real lumber sizes (feet). Micro-Mark, The Small Tools Specialist -- Supplies for wooden ships such as accessories (blocks, deadeyes, belaying pins) and building supplies (wood, tools). Model Tech Studios -- O-Scale (1:48) People and Figures. This is just a sampling of links to Bluenose and Bluenose II, but they may get you started. Bluenosers -- Why are Nova Scotians called Bluenosers? Bluenose resting place -- Bluenose's final resting place? Updated: 18-Apr-2019 13:52 EDT -- Copyright © 2003-2019 Pieter van Vliet. All rights reserved.